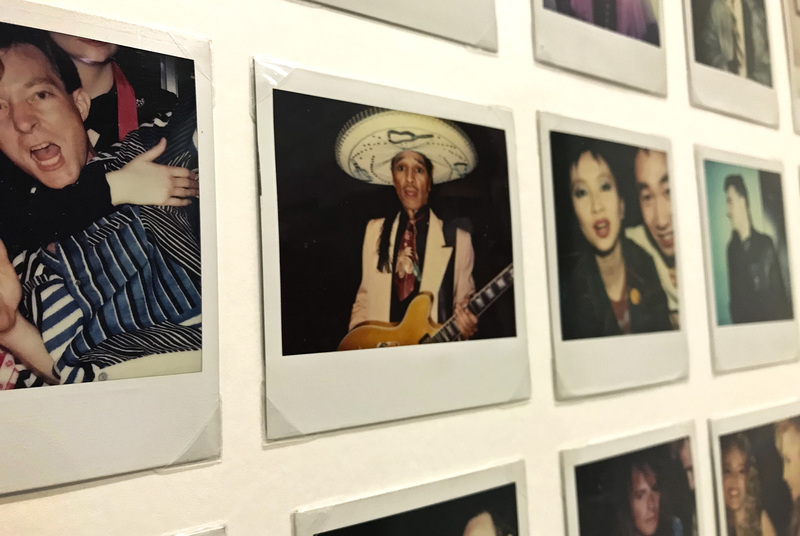 Very few guitars owned by Bob Dylan have ever come up for auction – the last one I can find was his 1963 Martin, played from the late 60s to 1977, most notably at the 1971 Concert for Bangladesh. That went for $400,000. This week sees the auction of his Fender XII twelve-string. Sending a press video link to me, Richard points out the hilarious voiceover. For a start, it isn’t a key Dylan guitar at all. Heritage Auctions put up a picture of Dylan playing it in the studio, saying, “the 12-string instrument was used to record the double LP Blonde on Blonde – it is believed to be one of the best albums ever released and may rewrite music history when it crosses the auction block March 16 at Heritage Auctions.” Errr, probably not. Those pictures of Dylan in the studio with the XII are captioned as being from the Highway 61 sessions on Fender’s own website. More important is the fact that no electric 12 string appears on any Dylan tracks from 1965 (unless I just haven’t dug through the 18 CDs of The Cutting Edge forensically enough). The hyperbolic narration ends with… “this piece could very well be the ultimate Dylan guitar – it is definitely one of the most important guitars of the 1960s, and popular music history for that matter…” No, no, and no. It’s not the storied Stratocaster he played at Newport in 1965 (the only other guitar of Bob’s that’s come up for auction, going for $965,000, although that authentication was controversial), which maybe fits the bill. His Greenwich Village Gibson, possibly. His small-bodied Blood on the Tracks Martin, again, maybe. But not this, a Fender publicity opportunity gift, that looks to be in unplayed condition, that may not feature on any of Dylan’s released music. Michael tells me that I should see the show before the auction happens, so I hotfoot it to Christies at St James, arriving at the back of the building to see Damien Hirst’s vitrine of a bull’s carcass pierced by lances (Saint Sebastian, Exquisite Pain, 2007). The piece was too heavy to get into the main exhibition space, so had been left in a loading bay with some disco lights and a music player. It is playing Michael’s rather glossy and antiseptic version of Bonnie Raitt’s “I Can’t Make You Love Me.” Suitably off balance, I head round to the front. 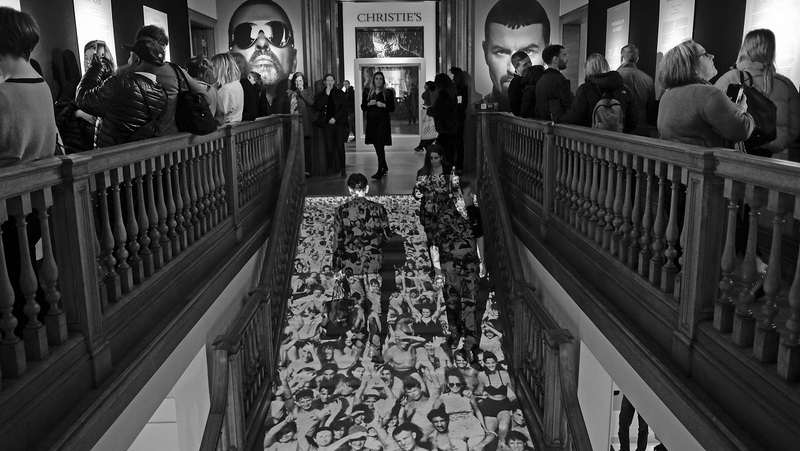 This is some show, room after room filled with giant blow-ups of George, video screens and mad outfits from video shoots, and George’s collection of the art of the YBA’s (with other artworks also). It is excessive and fun, but diverting too – his taste leans towards the glib and glossy, very surface-driven, but one man’s art and all that… and I guess if you’re rich, like art and have the wall space then this is what you do. “Well, I was listening to this guitar solo on the radio in ’78, and I said to myself, “I can play a better solo than that guy.” Then I realized it was me! Have you had any unusual calls? I saw a preview at the end of last year (thanks, Hedda!) of Wild Rose, with Jessie Buckley playing a mouthy, car-crash Glasgow girl desperate to get to Nashville to be discovered. It should be a disaster of cringe-worthiness I know, but it neatly sidesteps most of the pitfalls (except for a cameo by Bob Harris that put one in mind of Graham Hill in Grand Prix). A typically excellent performance by Julie Walters helps, as does the fact that Jessie can really sing. She’s backed by a band of grizzled musos – Aly Bain and Phil Cunningham are there, as is Sam Amidon’s drummer, Chris Vatalaro – some decent songs, and a storyline that dials down the fairytale so as to not overshadow the realism. I loved it. It would sound something like this, but probably not as well-compiled and eclectic: Graham Lovatt’s latest incarnation, at Completely Sound, with the excellent tagline, Music from all directions. photo in Jazz History? A quiet Sunday night in 1953. The Dodgers had just won the pennant. J.F.K. and Jacqueline Bouvier had just married. And four titans of bebop came together in a dive bar for a rare jam session. Read it at the New York Times. The day ended and began with Giorgio Morodor. Doing some homework on Sigue Sigue Sputnik prior to appearing with Barney and Mark I listened to their hit single from 1985, “Love Missile F1-11”, and found that Moroder produced it, a fact I had not known. Their tagline – “We invented the future” – was never destined to last, and their schtick now looks quaint. And they last updated their website in 2015, so not really covering the “future” bit, lads. Part Adam & the Ants, part Sweet, it’s rockabilly strapped to an Autobahn rhythm. Still, it was fun to talk about their journey from Moroder to Stock, Aitken and Waterman, and then I got to quote Greil Marcus on Curtis Mayfield. Written for Pulp magazine last year. On July 20th 1965, Bob Dylan, the star of the Greenwich Village Folk Boom, exploded onto the pop charts. America’s first modern singer-songwriter, Dylan, in the six minutes and thirteen seconds that it took for the epochal “Like a Rolling Stone” to be debuted on US radio, virtually created grown-up rock music. But Dylan’s spectacular reinvention of himself and his music had not just happened overnight – it had been brewing for a while. 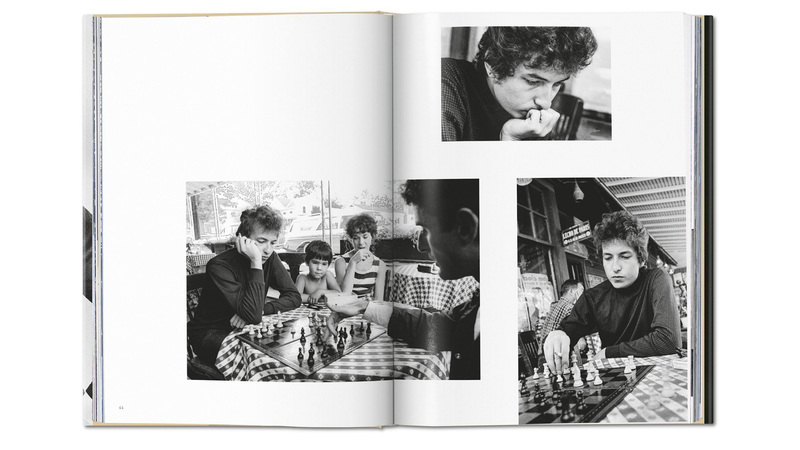 At the beginning of this astonishing, game-changing period – the like of which had previously been the preserve of fine artists such as Matisse and Picasso – photographer Daniel Kramer found himself, through a mixture of talent, persistence and chance, in the position of recording the highs of an extraordinary year in the life of Bob Dylan. So Kramer drove two hours north of New York City on a bright August morning and spent the day following the 23-year-old musician as he read newspapers, played chess, and hung out with Sally Grossman (Albert’s wife) and his own wife-to-be, Sara Lownds. In the early Sixties, Woodstock was still a sleepy burg, a place where Dylan could keep the increasing intensity of life in New York at bay. 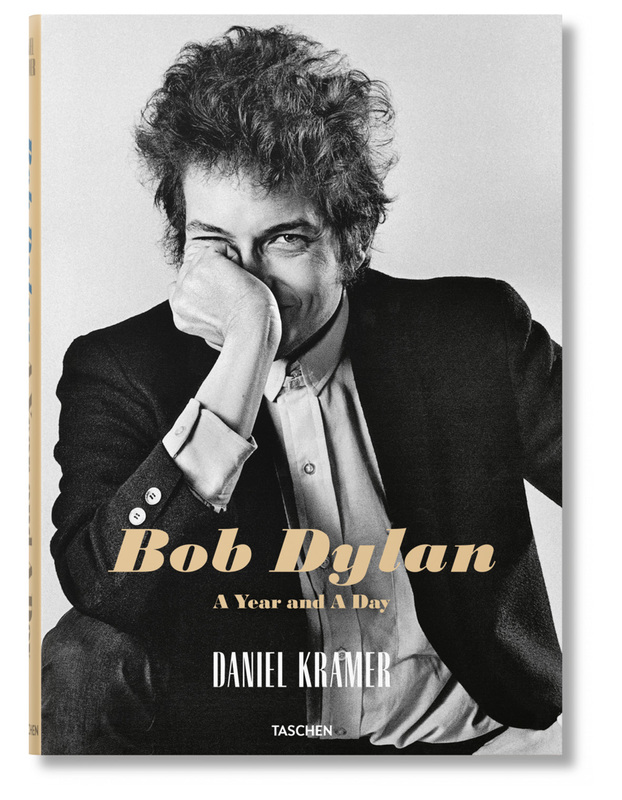 The pictures are winningly relaxed and goofy, Dylan obviously finding Kramer a copacetic presence, and from that simple beginning, Kramer found himself photographing Dylan on thirty occasions over the next 365 days. From Kramer’s fascinating recollections in the accompanying text, we find that he becomes one of Dylan’s travelling companions. In this role, he’s given both space and time to produce meaningful work. 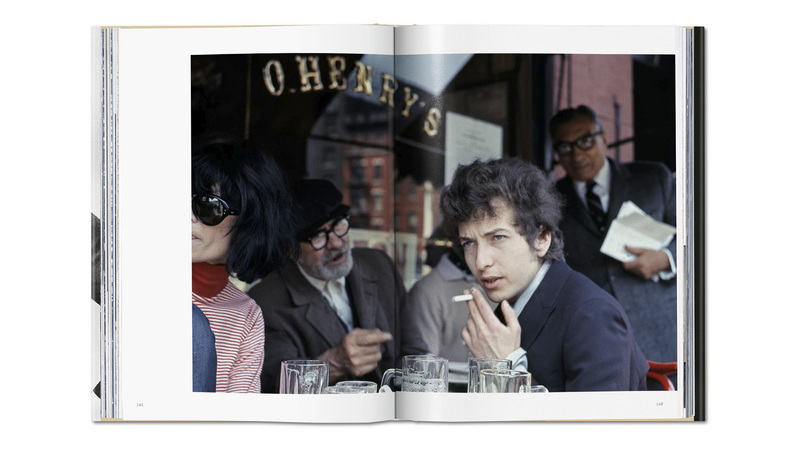 It’s a hallmark of Dylan’s relationships with the producers, musicians and photographers who come into his orbit – once they are admitted, they are allowed to bring their vision with them. 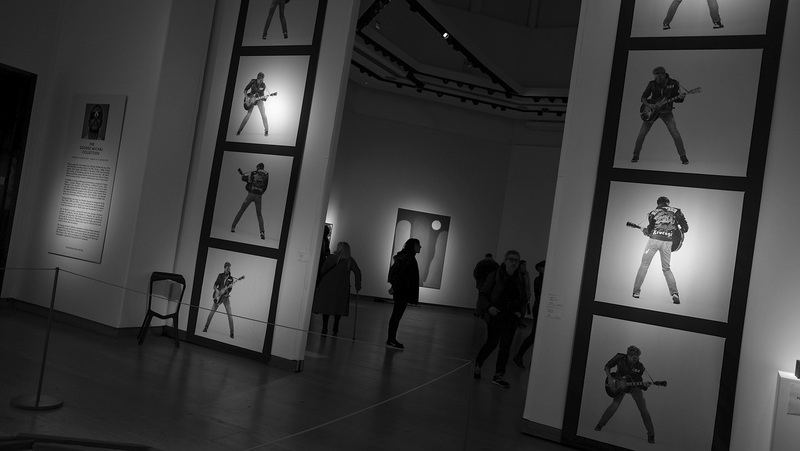 Only Alfred Wertheimer on his trips around the country with a young Elvis Presley had such access to a popular star, with similar results – to show the nuts and bolts of the music business and lift the veil at the moment that the cultural plates were shifting. Listen to any of the session tapes of recent release The Cutting Edge (every single note of music Dylan recorded, complete with false starts and unused takes, throughout 1965, the year of Kramer’s book) and you’ll find that Dylan’s moulding of what’s happening is subtle and understated, only occasionally direct and demanding. And if you met his approval, his world was your oyster. 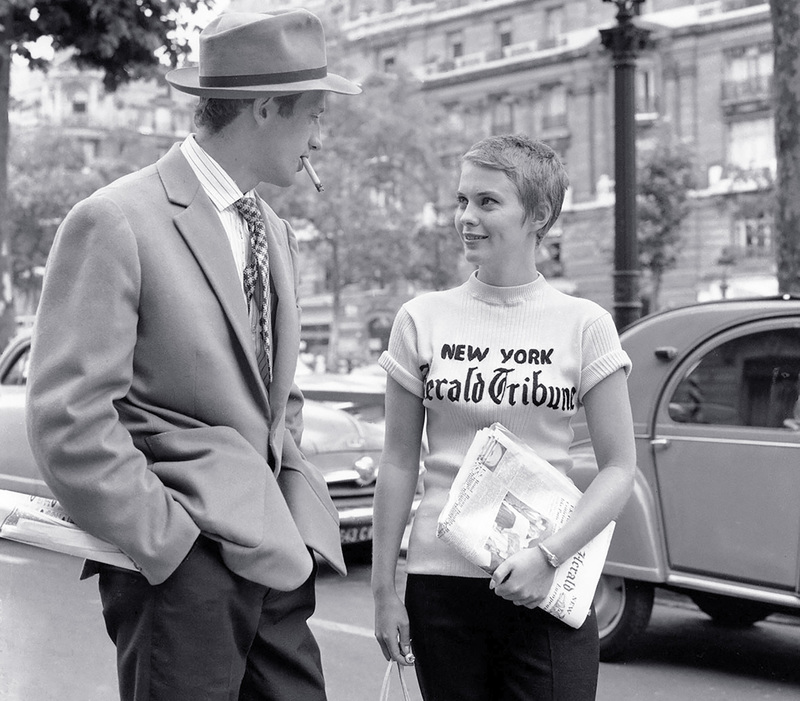 Kramer takes full advantage, producing classic black-and-white reportage backstage, onstage, in cars and cafes. 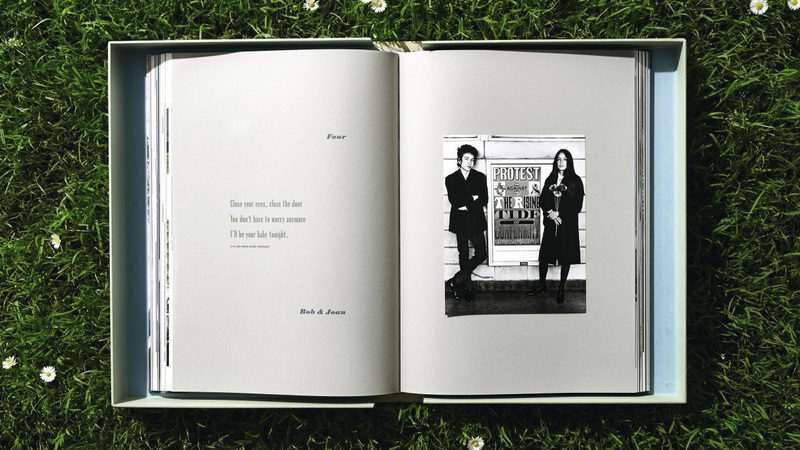 The book, beautifully laid out, is broken into sections (Woodstock / Town Hall / In the Studio / Bob & Joan / Early ’65 / Forest Hills) by lyrics letterpressed onto heavy matt paper, with Kramer’s excellent narrative set in typewriter, an era-specific evocation of the prevailing technology of the time. The sheer size of the book lets you feel that you’re at a really well-curated exhibition, one where the scaling and sequencing of the images are perfectly judged. 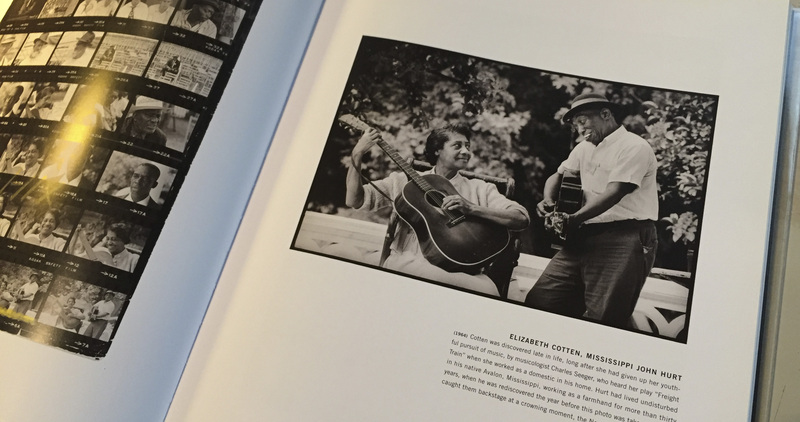 The detail drawn out of the gorgeous grain of the 35mm Kodak Tri-X film that Kramer used is wonderful, and the book is a much more satisfying way to see these photographs than as individual prints in a gallery. 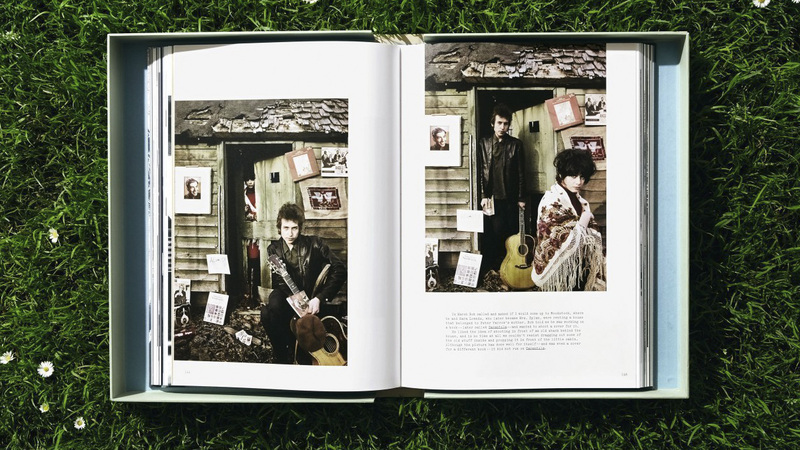 The colour film that Kramer shot of Dylan, the cover session for Bringing It All Back Home, one of the two albums he would release in 1965 (the other, Highway 61 Revisited, also had a cover shot by Kramer) sits happily at the centre of the book, in a section called “Intermission”. 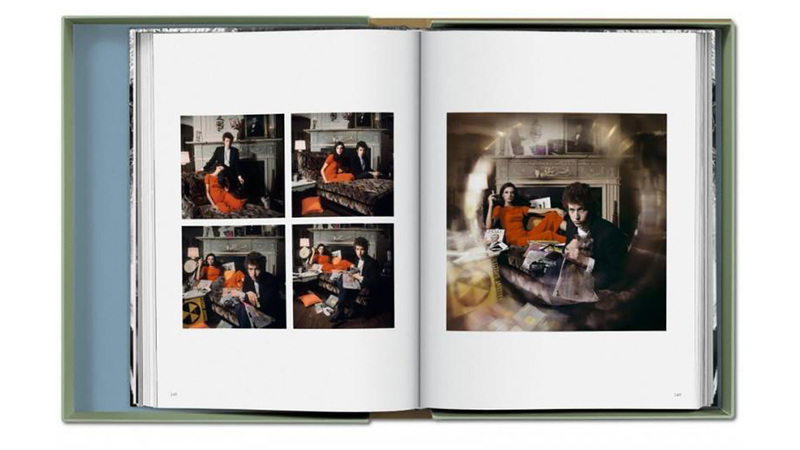 Kramer’s studio shoots (including a meeting at Kramer’s New York studio that would provide the cover for Dylan’s first book, Tarantula) give a break between the reportage either side and show that his earlier experiences in the studio with Arbus and Halsman served him well. Having been present at the recording sessions, Kramer knew that he had to deliver something that related to Dylan’s new direction – and a technique he was working on for a fashion shoot with his 4×5 view camera seemed perfect. It enabled him to make “multiple exposures on one sheet of ﬁlm while moving, blurring, or keeping sharp parts of any single exposure”, a world away from the fly-on-the-wall 35mm reportage that Kramer had been shooting up to this point. Around this time, a new Dylan snaps into view, as the pages turn from images of joking around with old friends to those of Dylan with an early hero, Johnny Cash. Dylan is about to play one of his last acoustic shows and has morphed from the chubby-faced Chaplinesque troubadour to a more angular and focused presence. Over dinner with Cash, he seems to be burning with a particular intensity, fixing Dan Kramer and Cash both with a piercing gaze. The next stage is about to begin in earnest, and it will lead to the alienation of Dylan’s loyal fanbase. His artistic horizons are widening to take in Pop Art and filmmaking – from Greenwich Village to the Warhol factory was only a matter of a few downtown NY blocks, but in 1965 it was an artistic chasm. On one side, the gruesomely authentic folksters, on the other, the achingly hip (yet blatantly commercial) scenesters. As Dylan moved inexorably across from one to the other, the air was thick with cries of Sell Out! and worse. Kramer finds himself shooting from the inside out. A show at Forest Hills with electric backing will plunge Dylan into a maelstrom that the world of rock has rarely seen, as a performer’s desire to follow his muse sees him branded a Judas and pelted with objects. 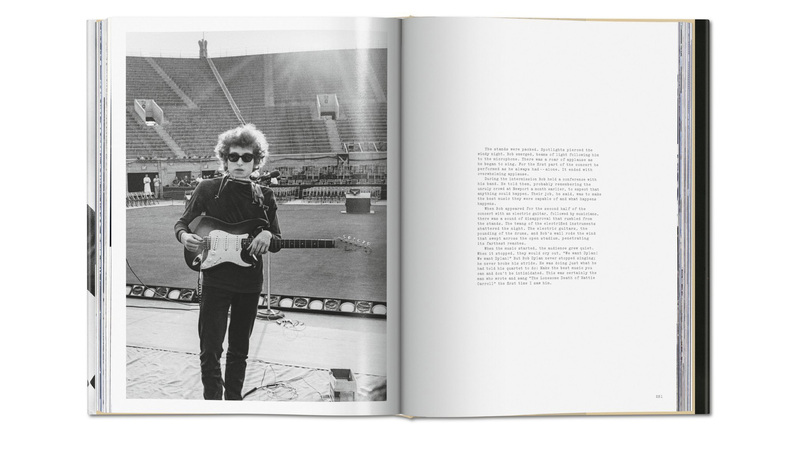 Visually, Dylan’s look begins to assume the sharp outlines of an icon – even in a close-field blur, with Albert Grossman far away in the stands of the Forest Hills stadium, Dylan is instantly recognisable, entering the period where he would be drawn by Milton Glaser as a rainbow-headed visualisation of the grooviness and excitement of the middle sixties. And that concert signals the end of Kramer’s travels with Bob. The last shots are of Dylan at one remove from his audience, backlit by blinding spotlights as someone invades the stage, chased by cops. A tour of the US and Europe awaits Dylan, his world accelerating until it culminates in a motorcycle accident that will remove him from the public glare for the following years. Daniel Kramer moves onto a long and successful career straddling editorial, advertising and motion-picture work, and never photographs Dylan again. And Dylan? Well, he’s still “on the road, heading to another joint…”, not stopping long enough to be pinned down. But we, luckily, have this epic production to linger over, reliving that remarkable year when the times were truly changing. Lindeman and her collaborators create an organic soundworld, and find the new in clever variations on the old. Sonically there are echoes of David Crosby’s chords, Joni Mitchell’s Hejira-era strumming, and, more tellingly, the spectral space found by the Cowboy Junkies when they recorded with one microphone in a church. But that makes the music sound too gentle – there’s a steamroller drive to the faster songs, powered by the bass of Ben Whiteley, who Tim singles out as the player the music seems to revolve around. Erik Heestermans disdains the obvious on drums and Will Kidman’s guitar solos are febrile and brittle in the manner of Richard Thompson. He’s also playing a structural role in the songs, teasing out melodies that Lindeman fleetingly suggests. The basic building blocks of rock – two guitars, bass and drums – hypnotically remade. Seventy five minutes went by in the blink of an eye. A fantastic show, where Basquiat’s crazed genius shined through. 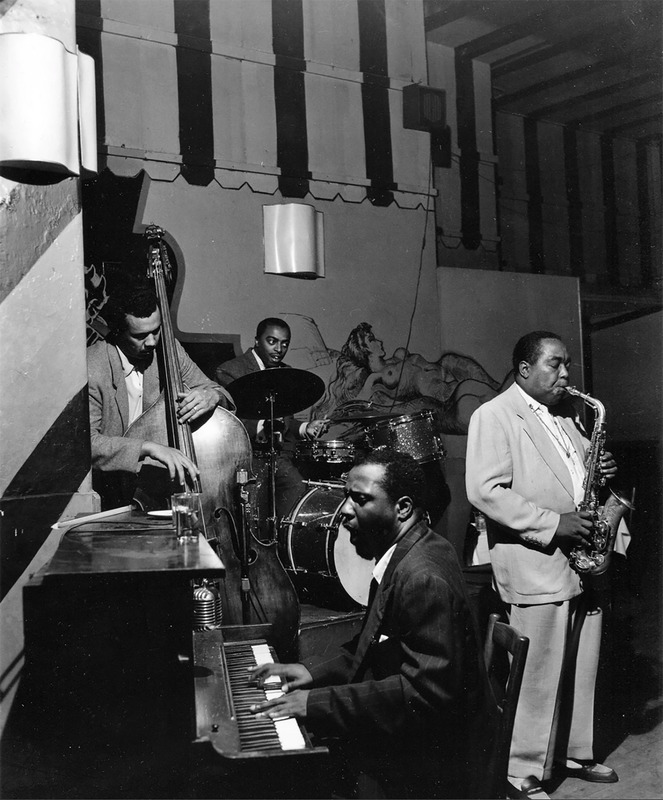 What I had forgotten was just how much he referenced musicians in his work – often an older Jazz than you may expect (Louis Armstrong’s “Potato Head Blues” and Ben Webster’s “Blue Skies”, say, although his main man was Charlie Parker). There’s also cracking film of August Darnell and Andy Hernandez leading Kid Creole and the Coconuts through their early-80s set in a New York Club. [Polaroid of AD above]. Voices: How a Great Singer Can Change Your Life, published by Jonathan Cape on 25 January. I’m really looking forward to this. Here’s a bit about Al Green: “We are in New York on Seventh Avenue, high up in the sky in his hotel bedroom. This is my second attempt to interview the Rev. The first time round, which he clearly only half remembers, if at all, from a year ago, we’d got bogged down in thick theological mud. I’d wanted to draw out the lineaments of his faith in order to unravel the fabric of his genius, or something along those lines. Most of all, I’d wanted to uncover the ambivalences that allow him to sing about God like a lover and about Love like a metaphysical poet. This is not possible in 20 minutes. And Al, being a true soul man, had chosen to sing most of his replies in robust Biblical quotation. This was great for me but no use at all for you, dear reader. I came upon this while looking for something else. It’s rather fine. Bob, Van Dyke Parks and Ry Cooder play Woody Guthrie’s “Do Re Mi” at the Malibu Performing Arts Center in January 2009. I decided to spend an afternoon traveling in the North Country fair but sadly wished that I’d never taken leave of London Town. (To see what prompted my going, see Five Things Extra: That Dylan Play, where two friends with opposing views write about it). Honestly, upfront I have to say that there’s more nuance and depth of character in a silent movie than there is in Girl from the North Country. Yes, I speak as a slightly reluctant attendee, but not because I was proprietorially feeling How dare they… or snottily assuming critical feelings about a work in another medium purloining Bob’s songs to its own ends. I’m not even sure that I would have been offended by Ben Elton scripting a play based around these songs, as he had done for Queen. And – also honestly – the music, arranged by Simon Hale, is delivered beautifully, with sensitive guitar, piano, bass, and fiddle accompaniment that manages to mostly stay away from a Mumford hoedown, and deliver true heft behind some good singing. But, dramatically speaking, well… Nothing here made me feel that the writer, Conor McPherson, had any understanding of these people and their problems in this small midwestern town. The plot seemed laughably dated, cobbled together from offcuts of Steinbeck, O’Connor, and O’Neill. Slow-witted lunk? Check. Old rich man who thinks money can buy him the love of a poor but pretty girl? Check. Con man masquerading as a bible salesman? Check. Boarding-House owner with debts and a mistress? Check. Black convict trying to escape… I could work my way through the cast, but you get the drift. There’s an almost offensive use of dementia as a dramatic device, with Shirley Henderson having to play the afflicted wife of Nick, the Boarding House owner. From the back of the stalls she looks too young (even if she isn’t in life) and plays her as a sexually incontinent, gratuitously swearing Manic Pixie Dream Girl. Really. Bits of business at the boarding house ( in a variety of clunky American accents) get interspersed with musical moments that are meant to round out character and story, but for every line that fits, there are two that seem tangential or just plain weird. “Sign on the Window” and “Went to See the Gypsy” (with its mention of “that little Minnesota town”) work at the start, but “Señor” (“Señor, señor, do you know where we’re headin’? Lincoln County Road or Armageddon?”) seems to carry a heavier apocalyptic load than these flimsy characters can bear. I thought Bronagh Gallagher the most impressive singer (she also played very tidy drums on a few songs) especially on “Sweetheart Like You”/True Love Tends to Forget”, but I found myself more than once involuntarily leaning forward and putting my head in my hands. I didn’t want to ruin anyone’s enjoyment of the performance so I had to stop myself emitting weary sighs, but by halfway through the second half, I felt my patience being stretched thin, as thin as the dramatic arc of the story. Thinking about the success of the play (it’s transferring to the West End soon), and the standing ovations at the finale, I wondered if there are people who go to see every musical in the West End, regardless of type. I heard the people behind me say that they must go home and listen to this Dylan guy, and I don’t mention that as a criticism. What I do think is that the bar is set too low if this farrago gets five stars from Michael Billington in The Guardian. As I walked back to my car, I scanned through my iPhone for some music to clear my head. Brian Ferry irreverently blasting out “Hard Rain” fitted the bill as I pulled out from the Cut and onto Waterloo Bridge. When, a few songs later, Lou Reed’s “Dirty Blvd.” burst out of the speakers, I pulled over and listened, powerfully struck by the fact that he paints – with shocking detail – a fully rounded and realised story in the three and a half minutes it takes to play out. Dreams, inequality, racism, celebrity, poverty, politics, and violence. All vividly brought to life. Three and a half minutes. The last two and a half hours is just wasted time. …which is not my favourite thing to do. But as two friends have opposite opinions on the play that uses Dylan songs throughout, it’s going to be necessary. [Image above shows Hibbing’s High School, Dylan’s Yearbook picture, Dylan onstage with his first band, The Golden Chords, and North Country Girl Echo Star Helstrom]. The play itself, set in Duluth (the possibly spurious BD connection – I couldn’t make out any dramatic justification for it), seemed to throw in every cliche of American southern gothic literature – the nutter in every family, the sinister and manipulative Bible salesman, the subterranean sexual passions, the wastrel would-be writer son, the washed-up pro boxer – in a not very stylish or original manner, and a couple of thousand miles north of its proper territory. And then, in a manner rather too reminiscent of Abba – The Musical, the cast burst into song every now and then. Some of the singing was good, and there was nothing particularly wrong with the interpretations, but it slowly dawned on me that this was a Crime against Art. 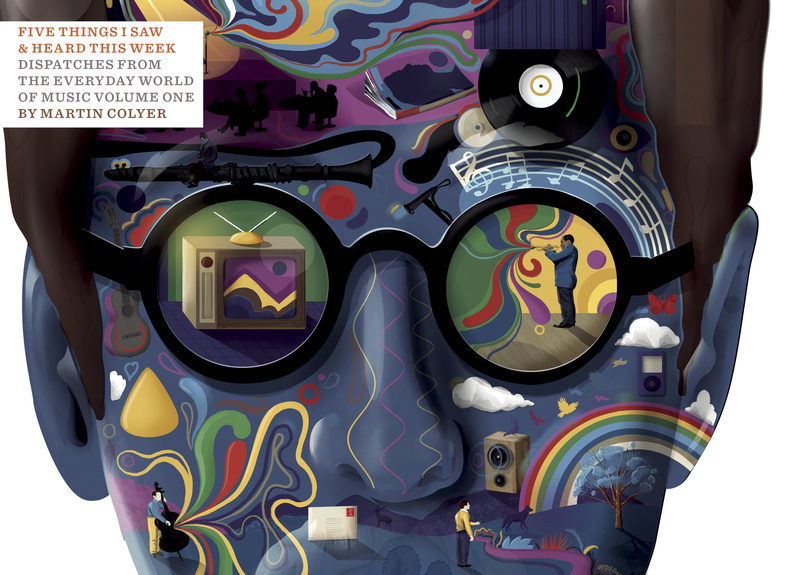 Recorded or live, these songs, mostly from the 60s and 70s, are all very precise, but at the same time extraordinarily open-ended; they play on the imagination, suggesting multiple meanings, feelings and depths, in a way that few songwriters have ever achieved so consistently (which is probably why the Nobel committee gave Dylan the literature prize). Shoe-horned into this derivative drama, each song seemed to have been limited, confined, diminished, flattened and emptied-out; there was no charge, none of the reverberation that I value in the originals. It was strange to hear these great songs transformed into something so small. “It’s a funny beast but I recommend it. Twenty songs in search of a play? Stuck in 1934 Duluth with the Eugene O’Neill Blues again? Set in a Depression era rooming house in the city where Bob will be born in seven years time, McPherson’s play floats in a fragmented way on a sea of songs. The good news is the cast and the music are wonderful. Worth the price of a ticket just to see Bronagh Gallagher (of Pulp Fiction fame) play the drums. When a falsely accused black pugilist enters stage left, you can guess what is coming, but when the inevitable “Hurricane” blows the audience away, it’s done with massive energy. To my ears some outstanding young singers in the cast (Sheila Atim, Arinze Kene). Jim Norton, who did a brilliant job of reading the whole of Ulysses for Naxos discs, plays a seedy old man. Dance is my Cultural Achilles Heel™ but I overcome it to marvel at this, filmed while the Shchukin collection was at the Fondation Louis Vuitton in Paris. “I was born in Chicago,” Lil Buck says, “Raised in Memphis, Tennessee…” Well, that’s a blues lyric right there. “It’s a dance style that started with Memphis underground rap music, and that music, the way it was produced, gave us a certain bounce. When I was around 16 years old I got into ballet. We made a deal with this artistic director that we would teach hip-hop, and they would teach us ballet…” There’s a moment at 2:45 in front of Picasso’s Three Women that is just astounding, but it’s not the locale, or the music, or the amazing art – this would be as strange and beguiling wherever it was performed. In the 80s Mark and I went to see, more than once, Lester Bowie’s Brass Fantasy, a band that consisted of eight brass players and one drummer. The man on the non-brass instrument was Phillip Wilson. A great drummer, he was equally adept at keeping the band ticking and purring through the buildup of “Saving All My Love for You” as slashing and slapping back at the horns as they riffed violently to the song’s climax. It was a holy noise, great on record but best experienced live. The only other things I knew about Phillip Wilson were that he was involved in the Art Ensemble of Chicago and that he had drummed with the Paul Butterfield Band around the end of the Sixties. This fascinating interview by Ethan Iverson with David Sanborn, the sax player, is about how important Wilson was to Sanborn. This NY Times video, by Maximilien Van Aertryck and Axel Danielson, is simply people climbing up a Ten Meter Diving Platform and jumping off. The twist is that none of them has ever done it before, and it takes some negotiating, either with friends or themselves, as they build up the courage to do it. And the reason that I’m writing about it is that the editing of the film is so brilliant, and the sounds are as important as the visuals. Tension and release personified – finger clicking, nervous scratching and deep breaths before the screams and the splash. Tim and I meet at Spiritland, somewhere that I’ve been meaning to go to since it opened. Then a couple of days later, Oobah Butler on Mr. Hyde wrote a piece on it that perfectly summed up my mixed feelings about it. 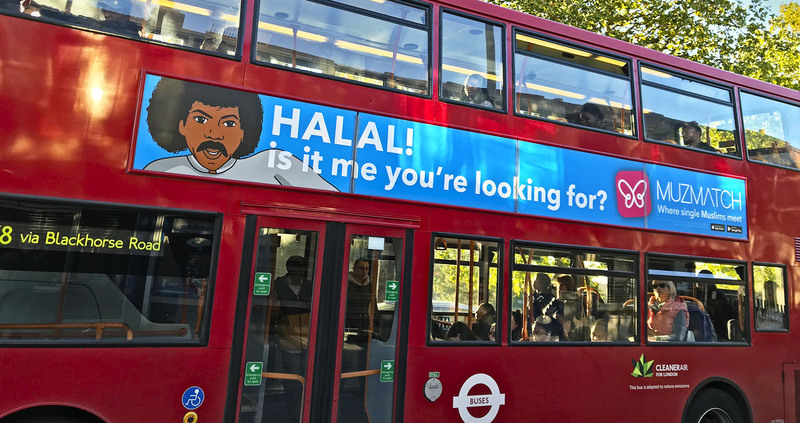 “Novelty has become the lifeblood of London. Most new spots open with a sideways glance, crazed gurn and elbow nudge, rather than straight-faced sincerity. But a new hero is bucking the trend: Spiritland, the “listening bar” in Kings Cross that’s “a paradise for anyone from the aficionado to the curious”. It definitely takes itself seriously, from its one-of-a-kind speaker system to DJ sets from big names like Hot Chip and Jarvis Cocker. And that’s great! But one issue: what the hot hell is a listening bar? Dudes in At The Drive-In T-shirts who occasionally look up from their William Burroughs novel to give an appreciative nod? 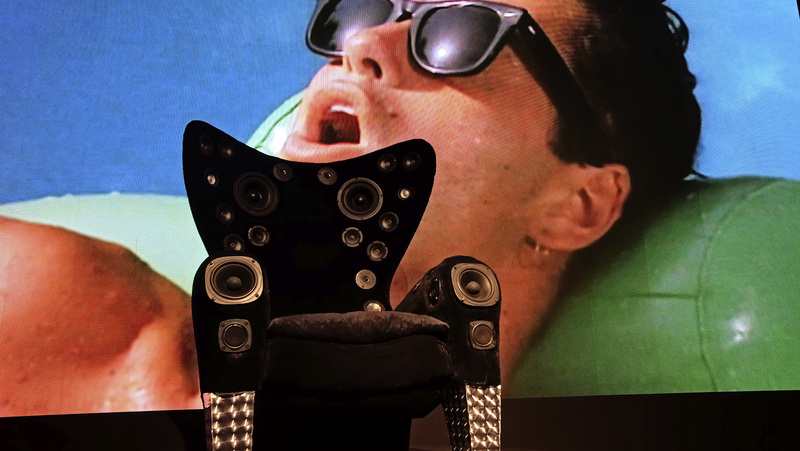 An immersive experience that leaves no room for anything but absorbing tunes? One so intoxicating that it can get you drunk on music? I tried to stay sober on a Thursday night to find out. Spiritland is tucked away in a ghost town of half-finished apartment buildings, mournful Bella Italias and broad, empty streets. It’s a diverse crowd, but everyone has one thing in common: we’re sat in a spartan room with dinner and drinks, facing The Bloody Big Music Blaster. Neither imbalanced nor throttling, the setup sounds wonderful. It’s official: I am woozy; totally drunk on music. But getting there requires an indulgent, eyes-closed isolationism that goes against its appeal to groups going out. You can have a table-banging debate about zero-hours contracts with the squad, or you can surrender to sound and fully appreciate the tech. Doing both is harder. Have you noticed how nearly everyone interviewed on either TV or Radio nowadays prefaces the start of their answer with “So” followed by a brief but weighty pause, as if they are lecturing a slightly witless teenager? I’ve decided to get in on the act this week. So, Liam Noble is a jazz [I’m not even sure that kind of nomenclature is serviceable anymore] pianist who writes like a dream. Everything on his blog, Brother Face, repays reading – this is his latest, which tells of his job transcribing thirty of the Bill Evans Trio’s performances for a publisher – “Anyway, back to Bill Evans. After four months the job was done. I walked away a new man. I walked away a hollow corpse, eaten away by the parasite Bill Evans. I couldn’t play a note, because every note that came out was his, and so I tried to blank him out, and to override this I had to think of “someone else” and how they would play the same thing. So now there were three of us…” Brilliant. There’s a fascinating interview with Bob by Bill Flanagan (whose Written in My Soul is still one of the best books on the stuff and nonsense of songwriting) on bobdylan.com, for the release of Triplicate. “Trouble Man”/Rickie Lee Jones (the string bass sounded huge – it could be Richard Davis (of Astral Weeks fame, for non-jazz fans), or Mike Elizondo (of Eminem fame) or Paul Nowinski, but, whoever it is, they pin you to your seat. “Blues in the Night”/Julie London (Big, brassy and sassy, with an amazing vocal sound and a gorgeous ending). “Deep River”/Horace Parlan and Archie Shepp (in honour of Mr. Parlan, RIP). “Poinciana”/Keith Jarrett Trio. We ended up by watching Keith Jarrett in Japan, playing “Old Man River” solo, which goes from contemplative to gospel to baroque through Billy Taylor, Broadway and Carole King (I swear!) in exquisite fashion.